There are two basic types of defense: "man-to-man" defense, and zone defense. I believe all good players must learn how to play good man-to-man defense. Yet there are many times that a good zone defense can really shut down a team. It often depends on what the other team's strengths and weaknesses are. So you must learn both. With this defense, each player is assigned to guarding a particular player on the other team. Each player must try hard to stop the opponent. Although it sounds individual, man-to-man is really a team defense. Every one must do his/her part. If 1 or 2 players don't play good defense, the defense will fail. Although you are assigned to guard one player, you must learn to "help" your teammates, and learn to "slide through" and "switch" the player you are guarding with a teammate, if one of you gets picked. We used to call this a "switching" man-to-man defense. You must learn what "help-side" means. Simply, when the ball is on the opposite side of the floor from you (and the person you are guarding), you can drop off your man a little into the lane and "sag" toward the middle to help cut off the passing lanes. Once the ball comes around to your side, you get back up tight on your man. 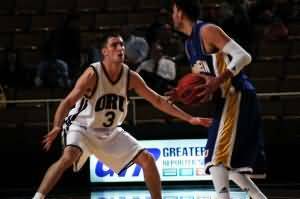 When I was younger, I was taught to deny the baseline, as baseline penetration often allows an easy basket or an easy dish to another player for a lay-up. Now coaches are advised to force the offensive player to the baseline. How do you reconcile the differences in teaching? Forcing to the baseline allows you to trap the defender there and helps establish your helpside defense. When the ball is in the corner, you only have to defend one side of the court and you can put all five defenders on that side. So we force the ball-handler to the baseline, but once there, you trap, and prevent any further penetration along the baseline. If you allow the offensive player to go uncontested along the baseline, it's usually 2 points. "Move your feet!" You'll hear coaches yell this all the time...because it is one of the most important aspects of playing good defense. You must have the desire and the quickness to move your feet in order to stay with your man, to get into proper position to take a charge, to move quickly to box out for a rebound, etc. You must not just "reach-in" and take a swipe at the ball as the player dribbles by you (usually a foul)...instead you must move your feet, hustle and stay with your man, and prevent him/her from getting to the basket by getting yourself into proper position. Also, when you "reach-in", you lose your defensive stance and balance and are now easy for the offensive player to get around. There are a variety of zone defenses (2-3, 3-2, 1-2-2, 1-3-1 defenses, etc). In a zone defense, you defend a particular "zone", or area on the court. You don't stay with a particular person (like in the man-to-man). Any time the ball comes into your area, you guard that person with the ball. The defenders have to learn the rules of each zone and how to "shift", or move, with the ball. 1. Most of the time, you should keep between your man and basket (but sometimes post players, will have to "front" a strong post-up player). 2. Guards get into a low position with your weight evenly balanced, on the balls of your feet, nearer your toes. Don't be flat-footed. Keep your weight off your heels. The key to good defense is you must move your feet and stay between the player and the hoop. Do not reach in a take a quick swipe with your hand. 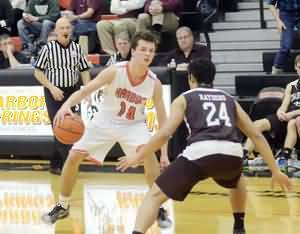 You will either get a foul, or the offensive player will go right around you. 3. Guards out front can play back off your man a couple steps if the offensive player is very quick, and outside his/her normal shooting range. This space will give you time to react, so that the offensive player will not get around you. If your opponent is a good outside shooter, then you must play tighter. 4. This brings us to the next point...know your opponent! Know his/her strengths and weaknesses. If he/she is a good shooter, stay close. If he/she can't dribble very well, stay up close and keep the pressure on. If he/she is quick and a good dribbler then stay back a couple steps. If he/she is right-handed and always goes to the right, over-guard the right side and force him/her to the left. 5. Watch the offensive player's eyes when passing... this will often tell you where the pass is going. 6. Watch the offensive player's belly-button, especially if he/she is quick and hard to stay with. The offensive player can fake you with a head fake, eye fake, arm or shoulder fake, or a jab-step, but the belly-button will always go only in the direction that he/she is going. 7. When the shot goes up, yell "shot!" and all defenders should box-out their men, and go for the rebound, and get the fast-break going. 8. Hustle! Hustle! Hustle! You gotta love playing tough, hard defense. Your good defense will win many games for you, especially those games when your offense is "off". It's not so bad if your shots aren't falling, if the other team can't score either. Your defense will keep you in the game until your offense finally gets going. When you are behind, the best way to catch up is by playing great defense and getting those rebounds. Who said, "Good offense wins games, but good defense wins championships"? Believe it. Much of good defense is inspiration and perspiration.